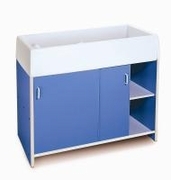 Round Edge EZ Clean Infant Care changing cabinet features round edge construction for safety and easy-access storage behind sliding doors. One paper roll included. (The changing pad is sold separately) Ready to assemble. GreenGuard certified. Made in the USA. Dimensions: 21.5in. × 45in. × 38in.